Nightwraith is a Creature/Monster in The Witcher 3: Wild Hunt. "Nightwraiths exude this immense sadness, this helpless wrath... I fear them, same as anyone. But most of all I feel sorry for them. — Aelline Altsparr, elven trobairitz. Compared to other creatures of the night — katakans, nekurats and werewolves, for example — nightwraiths (and their rarer cousins, duskwraiths) might not seem all that dangerous. 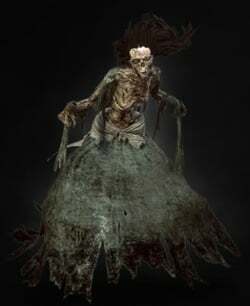 After all, one might ask, how much harm could a pale, withered woman in a tattered dress do? The answer: quite a bit. Instead of finding this out the hard way, avoid crossing fields and meadows at night at all costs. " When summoning a Nightwraith aim for the first signs of dusk. They will be extra powerful when summoned at midnight. To kill them you must hit them within the bounds of Yrden. The Yrden magic trap is also very effective at damaging them.